It's Day 9 and I'm Toni, here to share in the fun with this Christmas hanging I've made, using some fabulous Tim Holtz Alterations dies and the wonderful Tim Holtz Merriment 12x12 paper pack. 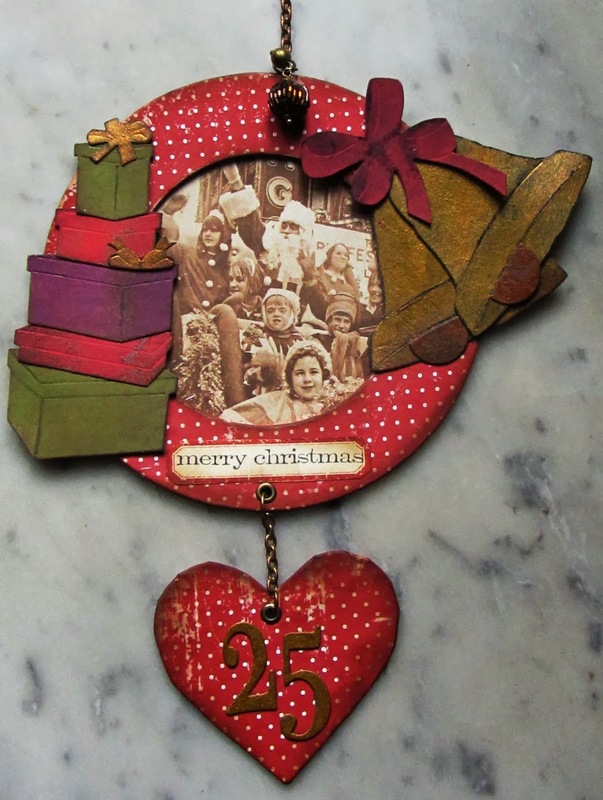 Those of you who know my work must realise by now that I'm a big Tim Holtz fan and that I love a bit of vintage goodness. Could be something to do with my age.... but lets not go there ! I started this project by covering a chip board circle I picked up some time ago, with a piece of paper from the Merriment pack. the paper is double sided and it took me some time to decide which side to use! The distressed white spots on a red background won. I used Studio Matte Multi Medium to adhere the paper to the circle and gave the edges a light blending of Vintage Photo Distress ink. I then adhered a piece of 'vintage' acetate to the back, I say vintage, as I've had these acetates for the longest time and they've taken on a kind of yellowish tinge, strange but perfect for my needs. I then chose one of the gorgeous sepia, vintage Christmas pictures, from another sheet of the Merriment Paper and adhered this to the back. You do not realise how hard it was for me to cut this paper up! I've been hoarding it for a while now, flicking through every now and then, drooling over the lovely images and patterns! I then set to with die cutting the shapes from Grunge Paper. 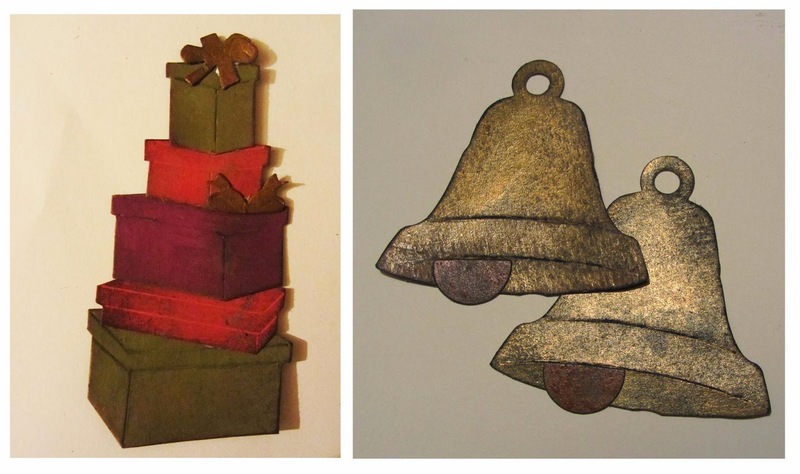 I've used the Alterations Christmas Bells and Packages and Bows. I was a bit late in coming to appreciate the versatility of dies, as I've got an electronic cutter. However, with the best will in the world my electronic cutter, cannot handle the variety of materials that the Bigz range of Dies can. So here are the die cuts after a little treatment with Distress Paints and ink. Such fun to make! Once dry, I adhered the bells and the packages to the circle, using dimensional tape to raise them up slightly. The little heart, I've added wasn't part of my original plan, but I felt it needed something else. I made a paper template, and then used this to cut out the heart from a piece of chip board. I covered it in the same way and added the die cut numbers, which were also painted with Distress Paint. The chains and beads I've used, are salvaged from my collection of cheap and cheerful jewellery! Now, if you fancy picking up some Alterations Dies and Tim Holtz Papers, Kim has a fantastic special offer today, as part of our Twelve Days of Christmas celebrations, there's 25% off Tim Holtz papers, Alterations and Texture Fades! Just use the discount code 12DAYS9 at the checkout. How cool is that ? Here are some of the ingredients I've used for this project, You can find them in Kim's fabulous eclectic Paperie shop. This has been fun going backwards on this hop to see all of the beautiful creations! I am just blown away by your crafting talents and during this busy time of year too no less! Thank you for taking so much time to share! This is a fabulous project! Love the Merriment paper as well and dies! Toni, your Christmas hanging is FANTASTIC! LOVE the photo in the circle and the bell and package! GORGEOUS papers, too!